Iconoclastic black metal with a blazing bombast and a triumphant sense of fury that guides the listener into the darker corners of the netherworld Black Flame is an extremely exciting black metal band from Italy who are unafraid to smash your face in, yet also able to invoke powerful meditative moments. The Origin of Fire is a fresh sounding record that provides moments of true inspiration in an overcrowded genre. Prone to extremely dense and musically intricate moments, Black Flame are black metal of a rather pure breed. From the ethereal opening notes of Wandering Hermit you immediately get a sense for the otherworldly magic this band seems to be turned on too. 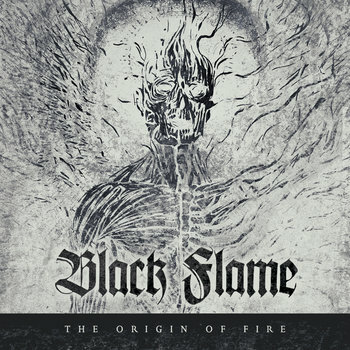 Black Flame speak to a magical world that exists in the cracks of this one. They understand where we are headed and what we need to do to have the strength to carry on with our lives. Supremely confident The Origin of Fire features brash guitar lines and powerful percussive moments that reek of primal energy. Yet within this, Black Flame somehow manage to remain personable and if not approachable, at least intimate. It grants the listener a look into something wonderfully fucked up if nothing else. Black Flame are going to force you to reconsider the horrid world that we face every day and give us a sense of hope that might be able to pull us through the dark times. Black metal is there to give the most depressed and frustrated of us a sense of belonging and empowerment. As lost as you may feel, record like The Origin of Fire reign triumphant with powerful riffs and fierce vocals that come searing from the sky to bless the listener with the strength to face another day. For if we didn't have this, we might as well be dead.